Nissan Titan rolls out the Midnight Edition! Nissan – continuing their lineup of factory custom editions – added Titan, Titan XD and Frontier pickup trucks to the program for 2018. Looking as good as any available from a premium after-market supplier, Nissan has nailed it with good looks, premium fit and an affordable price. Just as the Midnight Edition look makes a distinctive statement in their CUV/SUV and sedan vehicle line – that statement becomes ever more powerful on what Nissan calls their ‘every- duty’ trucks. 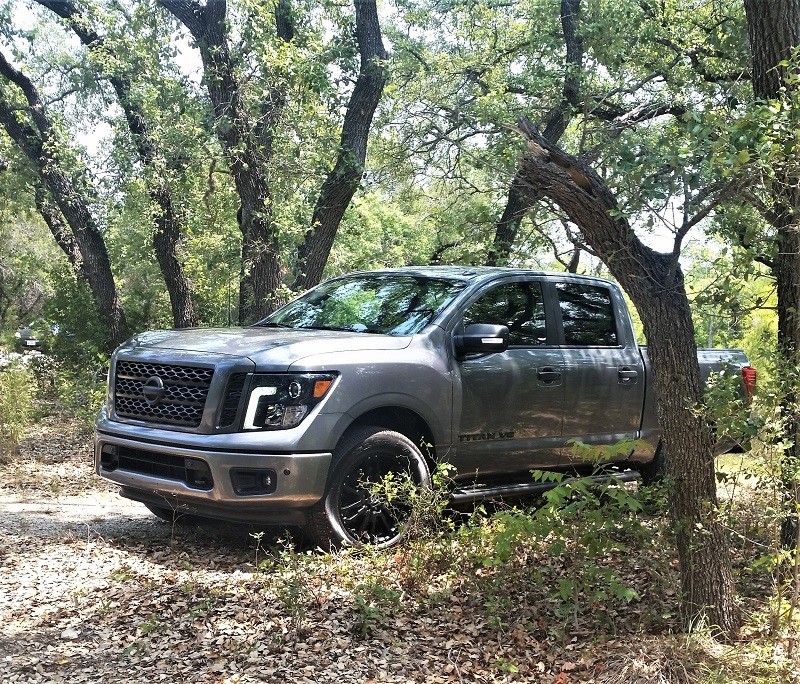 The Nissan Midnight Edition Package on the Titan V8 full-size truck features a choice of exterior colors: Glacier White, Gun Metallic Monotone and Magnetic Black Monotone. 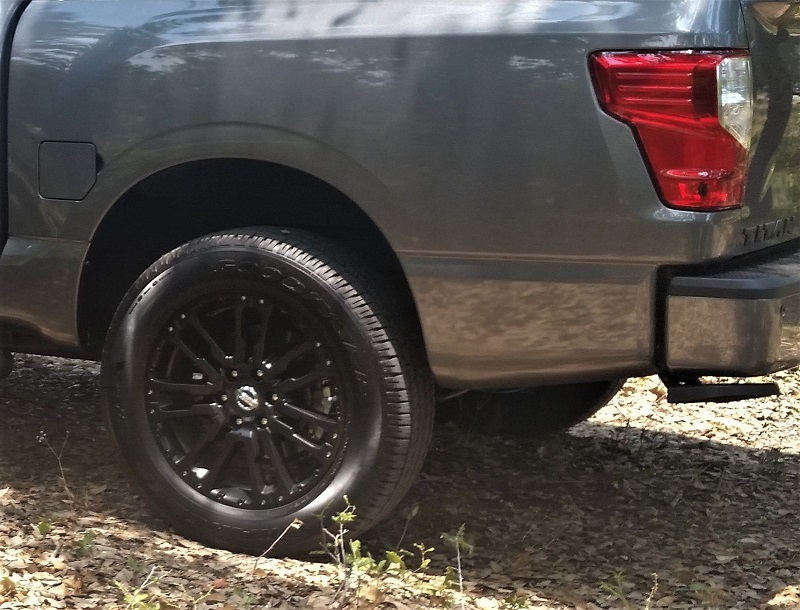 The Midnight Edition Titan stands tall and strong on it exclusive black 20-inch alloy wheels mounted with Goodyear P275/60 R20 Wrangler SR-A all-season tires. The bold front grille and bumpers match the chosen body color while other exterior elements compliment the ‘Midnight Edition’ theme. They include Black-trimmed Headlights, Black Fog Light surrounds, Black Outside Mirrors and Door Handles and Black Step Rails. Special Black Midnight Edition badging and Charcoal interior trims complete the package. 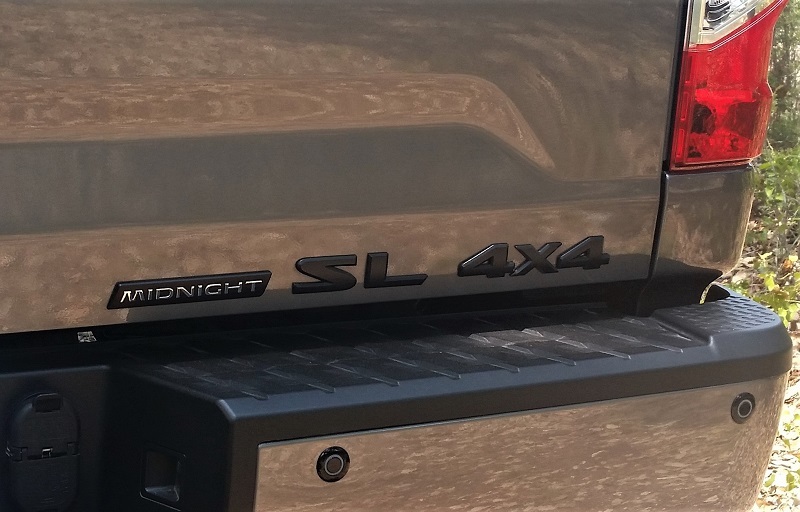 The 2018 Nissan Titan Midnight Edition trucks can be ordered in the SV or the higher SL trim levels in 4x2 or 4x4 configurations. The price of the package for each trim is the same – $1,250. SV 4x2 $42,315 with the SV 4x4 $45,345. 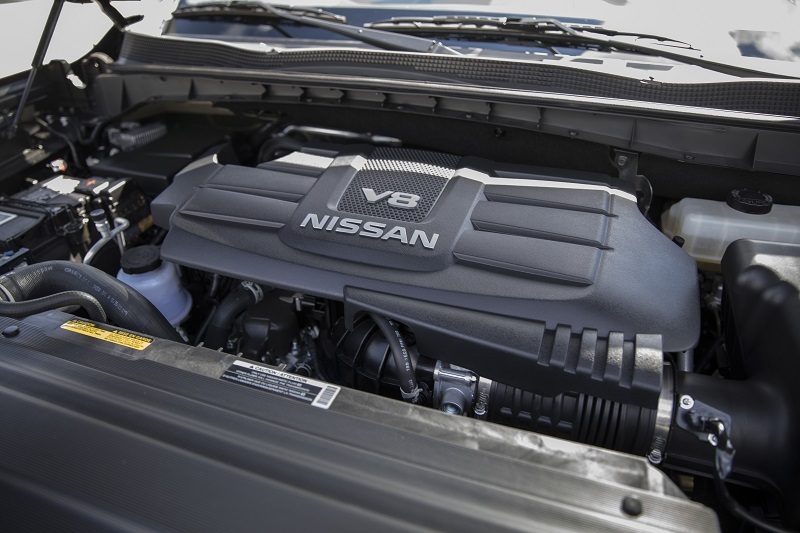 Nissan sent us a Titan 5.6L Endurance V8 SL 4x4 Crew Cab for a weeklong test. Our test truck was in the very handsome Gun Metallic Monotone. The interior was Black with Charcoal accents. As handsome and capable as it was outside, so it was inside. Elements included Leather Appointed Captains Chairs featuring 8-way power driver and 4-way passenger with a large front console that has lots of storage room including enough for a 15-inch laptop computer. The rear seat was 60/40 flip up with fold flat floor and storage. Technology and other features included Remote and Push Button Engine Start, Front and Rear Sonar, Advanced Driver Assist Display, multiple power outlets, Tire Pressure Monitoring, Blind Spot Warning with Rear Cross Traffic Alert and more. Of note was the awesome Rockford Fosgate 12-speaker Premium Audio system which delivered a pulsating audio experience in the cabin. 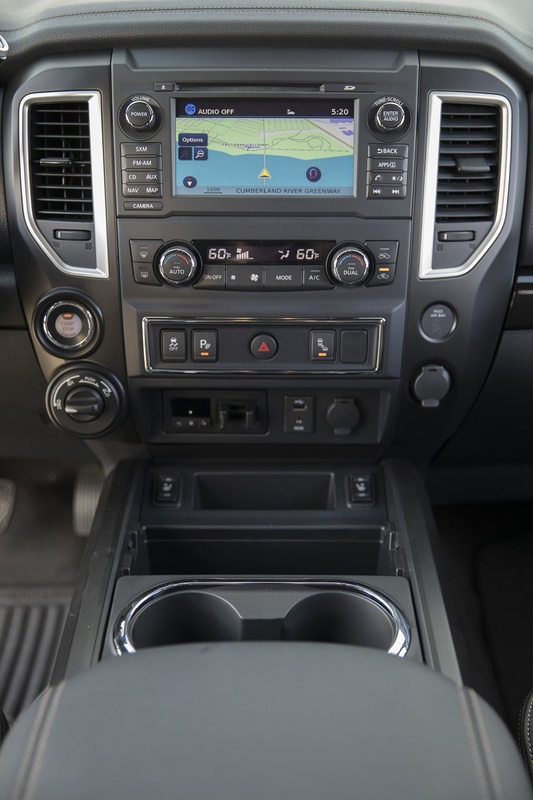 Our Titan also included Nissan Connect with Navigation, 7-inch color display, Nissan Voice Recognition, SiriusXM Satellite Radio, Traffic and Travel Link, USB connectivity, Bluetooth Hands-free Phone and Siri Eyes Free. Don’t let the 7-inch display put you off. It is vividly crisp, bold and easy to read – as good as some much larger. All Endurance V8 Titans are powered by the U.S. built 5.6L Direct Injection gasoline engine (developed for Titan). They pump out 390 horsepower with 394 lb.-ft. of torque and are mated to a 7-speed automatic transmission with manual gear select. Fuel economy ratings (4x4) are 15/21 mpg city/highway and 18 mpg combined. 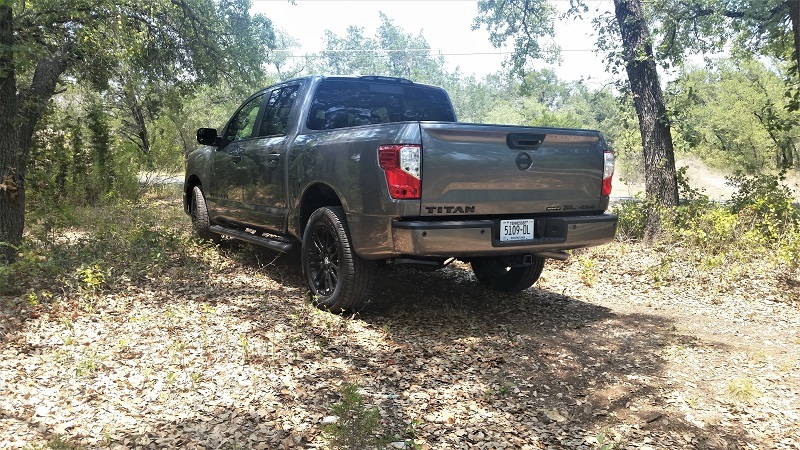 Titan hauls loads up to 1,950 pounds and tows up to 9,740 pounds when properly equipped – and our Titan was. Our test Titan was equipped with a Shift-on-the-Fly 4-wheel drive system with 2-speed transfer case, Tow/Haul Mode with Downhill Speed Control, Hill Descent Control, Hill Start Assist, Brake Limited Shift Differential, Integrated Trailer Brake Controller, Trailer Sway Control, Trailer Light Check, Class IV Receiver, 4-pin/7-pin Wire Harness Connector, Rear View Monitor with Guidelines and Intelligent Around View Monitor. Besides being a decent hauler, this is a workhorse with the 20-inch wheels and tires, Front Tow Hooks, Spray-in Bedliner, Utili-track cargo management system, LED Under Rail Cargo Lighting, Tailgate Illumination and a 120 V Power Outlet in the bed. Other elements included Automatic LED Headlights, Fog Lights, Power Folding and Heated Exterior Mirrors, Power Sliding Rear Window and the rugged Black Step Rails. Nissan had added a couple of extras on this test truck. 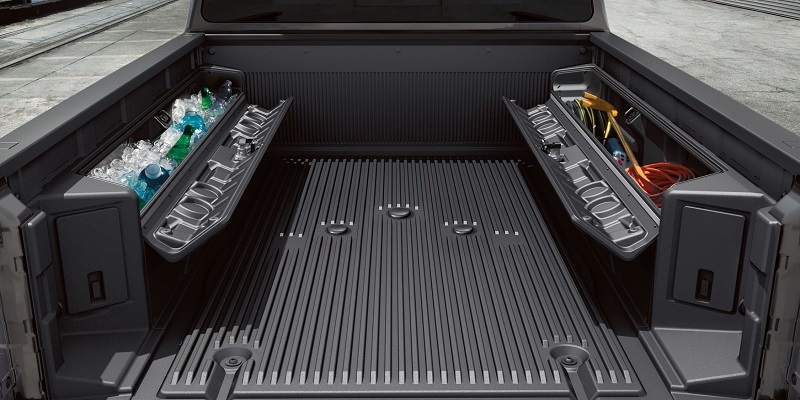 They included the convenient Rear Bumper Step, Electronic Tailgate Lock, Midnight Edition Floormats and – a favorite of ours – a pair of the Titan Box in-bed lockable storage units. 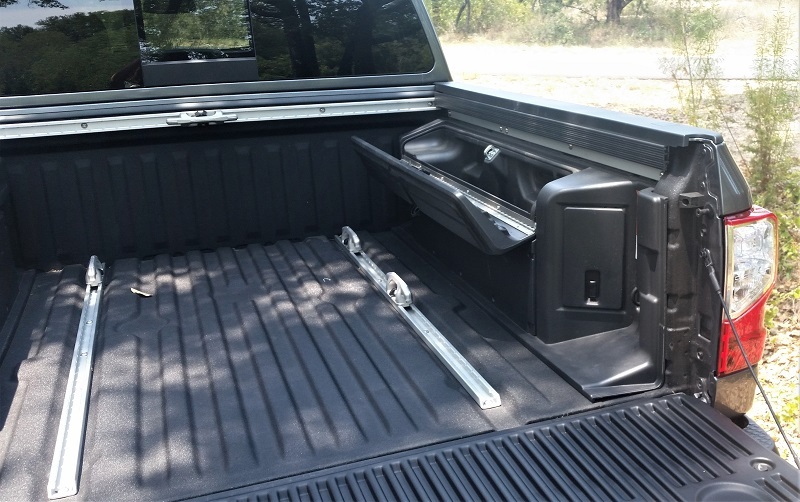 We like these in particular as they are removable and they fit below the lip of the bed, allowing a tonneau cover to fit over them for extra security. For tools, toys, refreshments or ‘other’, these do the job. 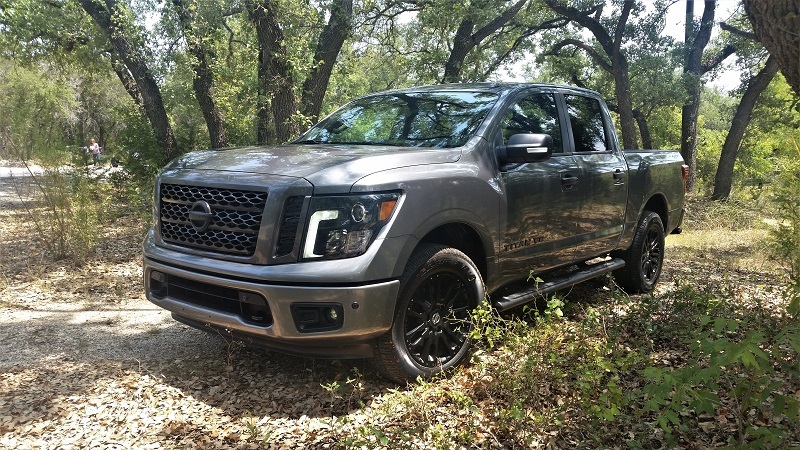 The delivered price for our 2018 Nissan Titan Endurance V8 SL 4x4 Crew Cab was $54,775. Nissan offers a full range of ‘every duty’ Titan Endurance V8 full- size trucks in three cab sizes and 4x2 and 4x4 configurations. Titan trucks begin at MSRP $30,030 (single cab S 4x2) through the Platinum Reserve 4x4 Crew Cab at MSRP $56,800. All are covered by the Nissan ‘America’s Best Truck Warranty’ that features bumper to bumper coverage for 5 years/100,000 miles. The Midnight Edition Package is available on several vehicles in the Nissan line. In addition to the Titan full-size pickup, you can order the package on the larger Titan XD and Frontier mid-size pickup trucks. The Rogue, Murano and Pathfinder CUV/SUV and the Sentra, Altima and Maxima sedans also have Midnight Edition Packages available. 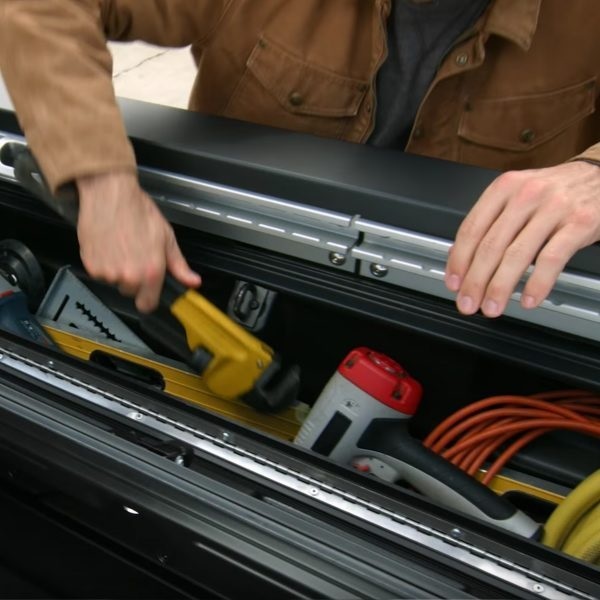 The contents of the package on each vehicle varies depending on the features of each model.